If you mow your lawn regularly, your friends, neighbours and visitors will always be admiring and envying your green and healthy masterpiece. For you to achieve the perfect and desirable lawn, you should always have the right skills and tools so to help you out, we supply some of most modern and affordable lawnmowers on the market. We sell different high-quality brands including Sharp, Mountfield, Toro, Etesia, Stihl, Stiga, and Viking. Whenever you buy any of our lawnmowers, we give you the chance to meet some of our highly-trained technicians who will provide advice on how to use and maintain the machines. Nothing interferes with the beauty and elegance of a garden like the presence of weeds; those uninvited and dangerous guests that deny your plants the chance to have space and nutrients. The best way to get rid of weeds from your garden is by pulling or digging them out before they start flowering. Avoid using commercial weed killers though as they contain chemicals that might be harmful to your children, pets and favourite plants. Cut back any overgrown or sprawling shrubs and climbers such as summer jasmine and honeysuckles before they start giving your garden an ugly and unpleasant appearance. At The Mower Shop, we offer hedge trimmers that are strong enough to face even the toughest conditions that can be thrown at them. One of the many advantages of our machines is that they are available in both petrol and electric variations, meaning you can always use them easily, whether there is a power supply available or not. As your plants continue to grow, it is very normal for them to shed leaves and twigs. If you allow these to pile up, your garden will become untidy and lose its beauty. Worse still, they can easily suffocate and kill your plants if left for too long so to avoid this, consider raking the fallen leaves and twigs at least once a fortnight. 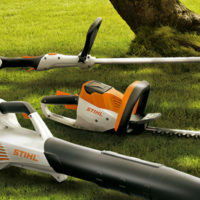 Hopefully this post has provided the assistance you needed to keep your garden tidy at all times, and don’t forget, for the best range of equipment for the job, make The Mower Shop your first choice every time.